This is another guest post from reader taka-ite. You can read his first one on Manukau’s Ronwood Ave carpark here. The writer has been a resident of Takapuna for about eight years. He is a fervent proponent of intensification and is not worried that some of it might occur in his backyard. He currently lives adjacent to a mid rise apartment and two other are being developed within 400m of where he lives. Panuku Development will develop a 450 space multi level parking building on the Gasometer site. Given the poor economic performance of the Ronwood Avenue Car Park that I posted on previously I have examined this development. 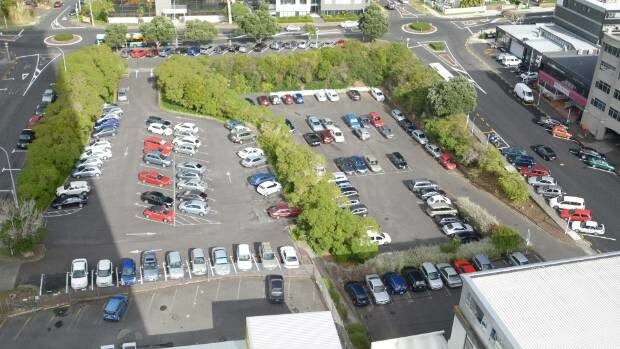 This proposal originated when Auckland Council decided to proceed with redevelopment of the 250 space car park at 40 Anzac Street and AT determined that it was necessary to provide at least 400 replacement spaces elsewhere. While this seems intuitive thinking a previous report commissioned by AT (the flow Report) suggests this is not so. Despite this huge number of car parks available, currently there are 11 vacant commercial premises on Hurstmere Road alone. Maybe masses of parking spaces are not the answer to commercial success? Current pricing for the leased gasometer site is $155 per month. This price level suggests that it will be extremely difficult for a multi-level structure to produce satisfactory returns. Current gasometer site parking prices are very comfortably the cheapest in the area. Because of this, demand for these spaces seems to way outstrip supply and this is indicated on AT parking sites. While the gasometer parking prices are at $5 per day, or $7 per week day, every other privately operated carpark in close proximity to the gasometer site is $12 or $14 for a daily earlybird space. (Yes that includes one 20m away). AT appears to believe that it has an obligation to provide cheap parking. At a presentation for the redevelopment of Hurtsmere Road an AT official informed me of this. AT have denied this when responding to an OIA request, but the Parking Strategy clearly facilitates very cheap parking as evidenced by the Victoria Street car park. I note that the Auckland Transport Parking Strategy provides that, “Use demand responsive pricing and charge the lowest rates possible to achieve occupancy targets. The gasometer site is about 200m from the main transport hub that brings people to Takapuna by bus from every direction apart from the sea. AT will (finally) implement the new northern bus timetable in October of this year. Given that it is largely the proposal that AT proposed is it safe to assume that it represents the public transport changes that AT thought most desirable? Car movements to the proposed gasometer parking building are likely to be detrimental to bus movements. AT used to believe that demand for parking in Takapuna could be met by pricing mechanisms. AT have recently consulted in Parnell to manage demand for parking by using pricing amongst other things. North Shore councillor Chris Darby says in June 2014, ACPL failed to get favourable terms with supermarket Foodstuffs. (This suggests that a car park of this scale simply wouldn’t stack up as a commercial proposition). Nowhere has there been any acknowledgement of the effects of climate change. The proposal in its simplest form says; let’s increase the number of car parks by somewhere around 25% and, of course, car movements will increase by the same amount. Concerned that the proposed car park was likely to be a fiasco much as arguably the Ronwood car park is I wrote to the Mayor. I have reproduced this (with minor alterations) from a previous post as it encapsulates on a high level the issues regarding this car park. The proposed Gasometer car park building is a $30 million project including land cost. The analysis done for a project of such a scale seems woefully inadequate with the fundamental component, demand, not established. AT has acknowledged that. I do not need to tell you what your Council Plan, AT’s Statement of Intent or Panuku’s Vision Statement say, but it is difficult to see how this project sits within these parameters. I am particularly appalled that it can be considered part of Panuku’s Vision Statement for Takapuna. These projects (another car park on the 40 Anzac St site is still a possibility) appear to fail miserably against all standards that might be expected: adequate planning; acting in accord with current policies; reduction of congestion; reduction of vehicle pollution; reduction of carbon emissions; preservation of land for housing; and sound financial management. The long stay market is distorted by the ridiculously cheap prices that AT charge. The gasometer site is $155 per month or $5 per day. Compare this with the three private sector car parks within 200m of this facility that are $14 per day (one seems to fluctuate between $12 and $14). As you might expect with such low pricing there are significant waiting lists for the AT sites. The current pricing begs the question, for whose benefit is AT operating these car parks. It is certainly not for the benefit of rate payers. Without being disrespectful, AT received the “flow Report” in 2016 that suggested AT should address the problem of increased demand by decreasing the number of long term parkers using pricing mechanisms. AT has done nothing and appears to intend to do nothing. A recent OIA request reveals that currently AT has no plans to increase parking prices for the Gasometer site. Perhaps part of the answer lies in what AT proposed only last year in Parnell. Faced with a significant shortage of parking, AT proposed that on street parking to be priced at $5 per hour after the first two hours. (Takapuna pricing is only $2.00 per hour and so there seems considerable scope for movement. Based on the price elasticity provided by an AT email of 12 October of -0.2 (i.e. a doubling of cost produces 20% less demand) any immediate shortfall in parking caused by redeveloping 40 Anzac could be instantly met by this measure alone. AT is caught in an unenviable position. Currently coming from one direction is a group of local citizens who believe that they have been conferred a right to have parking on the site at 40 Anzac St, seemingly in perpetuity. They are pursuing this action in the High Court. I am contending that the AT Parking Strategy does not permit AT to build on the Gasometer site. Regardless of the politics of the matter AT and Auckland Council are required to arrive at a solution that complies with their operating procedures. I have advised AT that I intend to lodge a complaint with the Ombudsman. If anyone has any useful suggestions to form part of my submissions I welcome your comments. No. It doesn’t fill up in business hours! This is incredible, really, isn’t it? Car parking provision induces traffic. Why wouldn’t they model the effects of that induced traffic? The effects will be mode share shift to cars from PT and active modes, added congestion, delays to buses, danger to active road users. Why is AT burying its head in the sand to avoid acknowledging this? I believe that the Gasometer site is the best site for the light rail station for the proposed Takapuna spur line advocated in the Congestion Free Network and as such it would be premature to build any carpark on the site…………….because once it has gone it’s gone and haven’t we done that far too often in the past. If they do a single purpose carpark building it will be a disaster. Did shorecity want to expand the mall by building a mall on the site and by joining up the new site to the old mall by an overbridge? First level can be street retail and top floors to be residential and offices. Let the car park be the basement. They’re a block apart though, so would be hard to connect them unless they also did the block in between. They can do an overbridge on Como st/lake road intersection. Alternatively they can buy the burger king site and use that. Does AT not see that by undermining all these directions, the cost to ratepayers is enormous? We’re trying so hard to provide transport options, shift mode-share away from driving to sustainable modes, make safety improvements, and it’s all costing money. But it all costs MUCH MUCH MORE when AT is making decisions like this that induce traffic and undo all the good work. I obtained the flow Report under an OIA and only have a soft copy. How would you like me to send it to you? Suggestion: Ask for the business case for the car park. This sort of investment should have a business case outlining costs and expected return based on proposed pricing. They should look again at the New Lynn model. When this was redeveloped, the 3-storey car park had a full floor of retail on the ground, plus future-proofing to take a 12-level apartment block on the top. The apartment block was completed about 2 years’ later, with 90% of apartments being sold off plans. Panuku can support the AT parking outcomes, but they should structure the deal and the development to ensure that a high level residential development can occur there to revitalise the town centre. New Lynn is a reasonable example of transit-oriented development, and is the right example for Panuku to turn to. I’m looking for research on the same topic, hopefully NZ-based and/or more recent than that article, if anyone can help. Build a limited underground carpark of say 400 spaces (including 100 for residents) and build a 20+ level apartment building above it. Potentially leave a space for a future rail link to that site. Underground car parks are even more uneconomic than above ground – totally financially infeasible. Multi-level underground car parks even more so. Don’t even mention it. Clearly it is not viable and ratepayers should not be subsidising parking for long term lease. A case may be made that the council should provide some short term parking, so as to set a benchmark price for other operators. However given the amount of on-road parking in the vicinity its doubtful that a multi-storey carpark is justified for this purpose, especially if it does not pay for itself. May want to contact private parking companies. They may have reports they will let you see/use in support. After all, the more public parking reflects commercial costs, the more money they are also likely to make. Presumably there could also be illegalities in AT’s actions if government funding is subsidising against commercial activities. As people go about their business in the big city, it’s not the government’s job to find them a park any more than it’s the government’s job to pay for their coffees when they have a break. If the traders of Takapuna think that a shortage of parking is holding back their business, let them form a cooperative to develop a commercial paying carpark. If the numbers don’t stack up to make that viable, that shows it isn’t needed. Madness. I really lose all hope sometimes. Yip, I’m pretty down about it today. The hoops the community has to go to just to get AT to stop wasting our money inducing traffic and creating sprawl! Heidi, change always starts somewhere. These days influencing someone is only an email address or social media post away. Carbon zero is going to happen and it will dramatically change Auckland. With 40% of emissions coming from fuel the way we travel has to change. I have another three or four posts regarding parking in development. It may not change much, but at least it might make some think. Fantastic post taka-ite – hope to see more from you in the future! I had missed your original post on Ronwood Avenue, which is also good reading. One thought, reflecting on this, is that parking pricing is a pretty good ‘trial run’ of what might happen if we put congestion pricing into place. There are some theory papers that show (reasonably convincingly, in my view) that optimising transport infrastructure supply will be a major source of economic gains from congestion pricing. But that’s contingent upon transport agencies trusting that price signals provide useful information, and that they can be used as an alternative to pouring concrete. The mixed record with parking supply suggests that we’ll probably end up leaving money on the table. One additional thought: There might be a case to build a consolidated parking garage in advance of deman demand, if it solves a ‘coordination problem’ for site-by-site redevelopment. It might give landowners confidence to redevelop sites with less or no parking, thereby avoiding a fragmented urban form. But I’m not sure that’s what’s going on here. I think that the introduction of congestion pricing will produce a very interesting discussion. Look at the battle to move petrol by 11 cents a litre. I agree with you that congestion pricing could produce huge gains for the economy. What if it reduces the need for an extra lane on the motorway? What if the money saved was spent on subsidies for public transport? Here’s a piece about Vienna where most of the spending is on PT and not roads. Here is a city where PT costs less than $2 per day and ridership is in excess of 950 million trips per year. A very different way to invest money with a very different result. Here, using the revenue from congestion pricing and applying it to public transport spending seems to be a great alternative to pouring concrete, using your words. subsidies contribute 29% of the aggregate revenue of Wiener Linien. Source: Wiener Linien, own compilation. capital depreciation and other non-liquid expenditures. has oscillated between nearly 300 and just over 450 million Euros. So Vienna’s PT fares are low but due to high levels of ridership fares pay over 70% of operating costs? Am I reading that right? If so, that’s a great performance. No PT systems in the New World get much over 50% farebox recovery, and they generally achieve that with higher fares and much lower per-capita patronage. But don’t they also start with a different premise in their planning? Is there a New World city that set out to radically reduce its carbon emissions, or do they just try to offer travel choice? In Vienna and it’s ilk you can attribute it to land use and density. All of Vienna sits inside an area about 15km across, the same as Albany to Britomart. While we have a busway with five remote suburban or light industrial stations and one significant demand centre at one end, they’ll have a transit line with twenty-odd dense residential districts and/or demand centres all the way along. I wouldn’t be surprised if their ridership per service-km is an order of magnitude higher than ours, especially on their local buses. One caveat, they’ll also have a huge whack of capital invested in extensive transit infrastructure that allows for efficient operations, I guess that isn’t captured in the farebox equation. Peter having used the system I believe the Vienna cost recovery figures. It is heavily used all day, not just the peaks. When you run a good quality RTN system you can get higher cost recovery. Dublin and Nice LRTs both make a profit. Nantes LRT gets 70% cost recovery. Don’t look at US or UK examples; they are hopeless. Good post! The city has shown us that the way to improve retailing in a depressed centre is to get more population in the walk up catchment. So no to the car park and yes to medium/high density residential. Otherwise we are spending money creating another Albany. Council needs to move from being a supplier of parking services to a manager of parking demand. Parking in the past has been a net earner but, as Ronwood has shown, that is changing. With LRT to Takapuna, AVs, and changing behaviour, it may become a stranded asset. This whole thing sounds like it is about appeasing ocal shop keepers. Ok so if needed give them each a local parking permit. But don’t stuff up the strategy for the whole centre to appease one small group.